I love scarecrows. 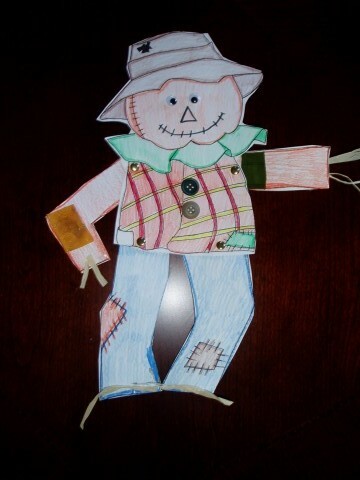 Here is a scarecrow pattern and craft off the Teaching Heart Website. Have your kiddos make their own scarecrow. Isn’t he cute? I was looking all over for a scarecrow pattern that had movable arms and legs. I couldn’t find one I liked online or in resource books, so I drew my own and he turned out too cute. The kids color and cut him. They glue on two buttons, two pieces of scrap fabric, wiggle eyes, and hay. They attach the arms and legs with paper fasteners. Then they have their own scarecrow. You may click here to print my scarecrow pattern (in pdf format) and directions. I wear a hat, And a shirt that’s torn.